Telltale's Walking Dead video game has been great so far; better and truer to the source material than the less-than-great TV show. But when I first started it up, I couldn't help but wonder why it was in color. 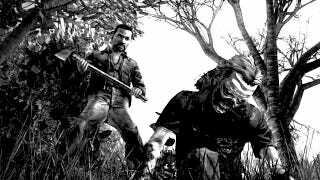 The game is cell-shaded and looks for all the world like a moving comic book, but Kirkman, Moore and Adlard's books are in stark black and white. I visited with Telltale during E3 to check out the game's second episode, and took the opportunity to ask writer and designer Mark Darin whether we'd ever get a black and white option for the game. "It was one of the first things we thought of," Darin said, "but they just figured out that you can have a still image and have it be black and white and look absolutely beautiful and pristine, but when you start moving around in a 3D world, it starts to become kinda muddy. They really did want to do it, they wanted to have that option available, but it just didn't make sense so they pulled it." It's too bad—the comic-book-style color can sometimes make The Walking Dead look too cartoony (despite its wonderfully dark overall tone and vibe). As that image up top shows, if the game could've worked in black and white, it would have been even closer to the books' gritty vibe than it already is. I'll more more in-depth thoughts on the next episode of The Walking Dead, which releases later this summer, next week.